The year is 1870. 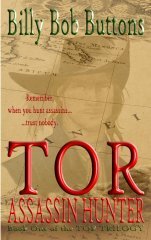 Major Tor, a mercenary and deadly sniper, is called from battle to stop Locust, a SWARM assassin who is plotting to murder the King of Sweden. Remember, when you hunt assassins... ...trust nobody. Billy Bob Buttons, a young talented author, is a secondary school English teacher and also a pilot. A finalist in The Rubery Book Awards 2011, he is the author of 'Felicity Brady and the Wizard's Bookshop' and 'The Gullfoss Legends'. 'TOR Assassin Hunter' is his seventh children's novel. A great book for children with some fantastic illustrations. TOR is a fascinating book. loved reading every moment of it. An wonderful book, keep you guessing and wanting more. A superb children's novel bursting with excitement. The top book of the year for 10 - 14 year olds. The start of a fantastic trilogy. Awesome! Children need a very good reason to choose to read vs. all the other options available. Nothing can match the appeal of adventure and courage. Well done and I thank you for helping me encourage my boys to read. A brilliant book for teenagers. Great book! It gets my vote for sure! Honestly, usually when I see something listed in the children's genre I skip it, because a lot of people think they have to dumb things down for children and that drives me crazy. This book does none of that. While keeping it child appropriate, I found it was something I could enjoy reading as well. I will definitely be recommending this story to my cousins, who have children,(I always read things before letting the the kids in my family read them) and to anyone else out there. This was highly entertaining and there was no room to get bored with the slow moments that some books have. I hope to read more from this author in the future. Outstanding book! And not just for YA either. I liked it and I'm 71 years young. Great book! Gets my vote for sure! Tor Assassin Hunter is by far the best young adult book presently on the market. It is fast-paced, full of wonderful characters - I particularly enjoyed the antics of the old Duchess - and blends adventure with mystery. The wolfish ending was a real twist and I'm salivating to get my hands on Tor Wolf Rising. High adventure pulls you in. Hello People's Book Prize, I am the headteacher at a primary school in North London and I'm delighted to vote for TOR ASSASSIN HUNTER for this prize. Edward Trayer (Billy Bob Buttons) has visited our school twice, always free of charge, to try to help our students with their writing skills. He is very inspirational and the children love his books.Every day I see a child sitting on a corner of our school reading Felicity Brady and the Wizard's Bookshop, The Gullfoss Legends or TOR. I worked with The Gullfoss Legends with year 5 last year as a class reader and the language was beautiful. The children enjoyed it greatly. I plan to work with year 6 and Tor after their exams in May. Having just finished the book I can tell you it is by far his best yet. Gripping! The children will love it. Good luck in this award. Our school is keeping its fingers crossed for you. The story is entertaining and funny; told at a cracking pace. Congratulations. This is a very fast paced book. Everybody in my class is reading it and the author is really funny. He visited my school and now everybody is trying to find the swords hidden in the book to try and win the ruby in the silver chest. A fun book. So much happens in it even on the first page. Tor is cool. He is a brilliant sniper. My brother will read it next. A talented novel from a new author. Keep your eyes on this one. Assassin's Hunter is an intriguing, fast-paced YA. Hi everybody. WOW! Not that's a complicated voting system. Anyway, Tor's a bril' book. I actually preferred The Gullfoss Legends by this author but TOR is excellent too. Darker; bloody, with wicked assassins in every dimly lit corner. Actually, it would make an excellent film. Brad Pitt as Tor or maybe Alan Rickman when he was younger. This is a page turner. My son Luke loves this book. It's great to see him so engrossed in his reading. The characters are very well written, my son wants to be part of the story. As a photographer in North Yorkshire, I had to read the book myself and was delighted to read the descriptions of Sweden; I will have to pay the country a visit with my son and my trusted digital SLR. Look forward to the next novel.Thank you and good luck, we hope you win. Simply remarkable! Keep on the good job! Good luck Billy Bob. You have worked so hard on your writing and deserve success. Love how it gets straight into the action! Enriched prose and exciting action adventure. A rare mix. The author has an eye for detail. It is not often you find a young adult novel set historically AND accurately. This is not your usual boy meets girl vampire/werewolf tripe. The first book in, what could be, a thrilling set of novels. Bravo! But I must add this. This is a deeply written book often violent with an intricate plot and complex historical setting. Why then choose the pen name Billy Bob Buttons?! Better for a Noddy book. A mixture of Colonel Sharp and Twilight with an icing of botany. A very original tale perfect for teenagers. Finished it over the weekend. Really good. Another terrific novel by this talented young author. A very enjoyable book...once you start reading you can't stop,lol. I read this author's other book, The Gullfoss Legends, with my daughter. She enjoyed it very much. So, when the author visited her school, we bought his new book, Tor. So far, we had read the first two chapters together. The book is yet to drop on the doorstep but my daughter was too impatient to wait, so I discovered the ebook for her. It is very different from his other books. Much darker, more violent too and I'm glad my daughter is a year older than when she read Gullfoss Legends. Edward, his real name I understand, has an amazing way of pulling you into the story. I want to know who the assassin is even more than my 11 year old child! But many authors can write a mystery, so why is he different? Simply put, he sets his mystery in the most interesting of times and places and his descriptions of the Prussian French Wars and of the Swedish countryside is, quite simply, wonderful. If this award really is looking to show off British writing talent then this is the author who should win this award. After my daughter spent one hour in his literacy workshop, all she wanted to do was be an author. How's that for inspirational. And he's not paying me to say this. In fact, I only met him for 3 seconds at a book signing in the school. Good luck! Awsome! My daughter loved the Gullfoss Legends one of his earlier books too. The best bit is when he has the fight with the assassin in the barn. He's really bad with a dagger but wins anyway. He is sort of lucky. I want to read the next book very much. Maybe he will visit our school next year too when I will be in Year 6. Vote now for this book and help a brilliant writer. Better than Harry Potter. Clever, fast moving plot against the backdrop of a war - revealing all its nasty horrors and dangers. A flawed hero fighting impossible odds. Good stuff! Did I think the book was good? Yes. Why did I read it? The author visited my school and we read a lot of it in class. This is not usually my sort of thing. Parts of it were very sad and parts of it were very exciting. He left his horse on the dock at the end which I thought was very sad too. Everybody in my class is raving on about it. I hope it will win this award. This is my mum's email by the way and she's helping me type. Billy Bob Buttons or Edward which is his real name visited my church s group of young people today and told us about his books and ask us if we wanted to vote for his book, ofc we want to help an member of our church, and we are swedish and liked it very much! VOTE FOT THIS BOOK!! An assassin killing botanist! Well, it's different. I hope the next book in the trilogy is good too. A very enjoyable romp. My young lad seems pretty engrossed anyway. His first ebook too. A great book for boys especially. It inspired my class not just to read, but to write too! Fantastic workshops run by the author at my school last week. A talented author who should go far. An enjoyable romp with lots of 'edge of your seat' excitement. Powerful beginning set in the French wars of the 1870s. A sprinkling of humor and an almost unsolvable mystery: who in the Solbakken family is the assassin? But by far the strongest bit of this novel is the descriptions of old Stockholm and the battlefields of French. I also liked the fact Tor was very multi-dimensional: he's not only a mercenary, he is also a botanist! In fact, the subtitle of the book is The Ramblings of A Swedish Botanist. The chapter where he sits drawing a flower is beautifully written and all the more powerful because it proceeds Tor's attempts to stop the assassination of the king. What a roller coaster and very deserving of winning a national award. A very exciting book full of sword fights and mystery. Tor is a flawed yet interesting character who is haunted by the memory of the men he has lost in battle and the death of his little sister. The ending is a real cliff-hanger. A fantastic book for YA particularly boys. Really interesting read, made me think about history - love it, especially the battle in France, what do you think? A fantastic book by Mr Buttons and some wonderful illustrations really bring it to life! A complex mystery set in 1800s Europe. A page turner. Billy Bob Buttons is an inspiring speaker and an inspiring writer. The children in our school love his work. You just can´t stop reading once you started! I love the richness of the descriptions in billy bob button's books. His Imagination knows no boundary neither does his passion for writing to make our kids smarter. Billy bob button deserves this award! The best book on my shelf. I met Billy Bob Buttons last week in our school in Wimbledon. He was giving a very powerful workshop to our Years 5 and 6. Having read much of TOR Assassin Hunter in the form of an ebook, I'm now eagerly awaiting my hardback copy. It is by far the best book presently on the market for boys. A fantastic job. Anybody who can get the boys in my class to read a non-fiction book deserves an award. Fantastic illustrations and a promising start to a trilogy for young adults. A very enjoyable, fun dark book. The beginning is particularly strong and I thought the chase through France was marvellous. A worthy book to win this award. Another fantastic story - must read for all children! I curled up with my Kindle last night and ploughed my way through TOR Assassin Hunter by Buttons. I must say, it was gripping. And I did enjoy Tor's rather dark sense of humour and also the continually befuddled Duke Solbakken. Fun twist at the end too. I would recommend this book to 11 to 15 year olds. Boys mostly. Lots of sword fights and duels! I will now pass it to my nephew. He's 12 and thinks he's a musketeer! I'm sure he will love it. I do not usually vote for books, or even bother to review them, but having just finished Tor I felt compelled to vote for it in the UK People's Book Prize. I work in the publishing industry and I can't help but feel this book, and indeed the trilogy, might be the beginning of a very successful and popular set of books. The language has been lovingly chosen, the action exciting and well thought out. Unputdownable, I suppose. Bril! A very cool book. The best is the sword fights. I love Robin Hobb and the Farseer Trilogy. Tor Assasin Hunter ranks up there with Hobb's work. I will recommend this book to lots of others. By the way, this award is an excellent idea. At last, an intelligent book for young adults. A complex thriller in which the teenager is not spoon fed. This author actually understands how to show and not tell. I have been enjoying Billy Bob Button's books for years now and this author is really deserving of this award. Not only are all his books witty and imaginative, they are also full of the most wonderful (and memorable) characters. Tor, the hero in this book, is the sort of fellow who you really root for. He is not perfect but the author has a way making him seem vulnerable to the reader. The descriptions of 1870 France, Norway, Denmark and Sweden are also fascinating. Well done Billy, I wish you every succes in this award and I'm lookng forward to reading the next book in the Tor trilogy. A superb novel particularly for boys. My son who is 12 simply will not stop reading it. I plan to try it next. A thrilling mystery that I could not put down. I'm a primary school teacher and, I must say, Tor Assassin Hunter is a fantastic class reader. Almost half of my class is presently enjoying it (Year 6). Congratulations Billy Bob on a top notch read. I so enjoyed the workshop the author gave to our class today. His book TOR is brilliant. All I want to do now is finish it. I'm half way through and I'm trying to work out who the assassin is. Superb book. The author visited my school today. I think the start is gripping. Wonderful book! Very exciting set in Sweden, Norway, Denmark and France. If you enjoy mystery and thrillers you will enjoy Tor.